The Mediterranean we know now was shaped by Phoenicians, Greeks and Etruscans in antiquity, by Genoese, Venetians and Catalans in the Middle Ages, by Dutch, English and Russian navies in the centuries before 1800; indeed, there is some strength in the argument that after 1500, and certainly after 1850, the Mediterranean became decreasingly important in wider world affairs and commerce. Keeping the sea safe was thus an important function of governments. It could be achieved the Roman way, by actively suppressing pirates in a series of vigorous campaigns, and then policing the sea; or, in times when no one was master of great tracts of the sea, merchant fleets could demand the protection of armed convoys, such as the Venetian muda. Pirate states in Barbary and elsewhere could be the object of eager negotiation, in the hope of securing guarantees for the safety of those with whom the ruler had treaties, or they could be confronted aggressively, as the Americans successfully chose to do at the start of the nineteenth century. There were bigger dangers to shipping as well, when great land empires reached the shores of the Mediterranean and began to interfere with movement across its surface: the Persians in antiquity, the Ottoman Turks from the late fourteenth century onwards, and (though attempts to acquire permanent bases failed) the Russians in the eighteenth century. Perhaps the most extraordinary case of imperial expansion within the Mediterranean is that of Great Britain, a kingdom with no Mediterranean shores, which, thanks to its acquisitions stretching from Gibraltar to Suez, managed to exercise a degree of control that aroused the ire and envy of powers whose lands actually bordered the Mediterranean, notably France. Control of the Mediterranean must be understood as control of the key routes across the sea. To achieve this, it was essential to establish bases from which ships could be supplied with fresh food and water, and from which patrols could be sent out against pirates and other interlopers. Thus from very early times settlements on offshore islands provided merchants with vital staging-posts as they ventured deeper into Mediterranean waters. Equally, loss of control of the shoreline could mean loss of access to timber and other materials essential for the building of a war fleet or merchant navy, as the rulers of Egypt were apt to find. Maintaining control of sea-lanes was especially difficult when competing powers dominated the shores and islands of the Mediterranean. Under Rome, a single political dominion created a single economic zone. But it was a unique occurrence. 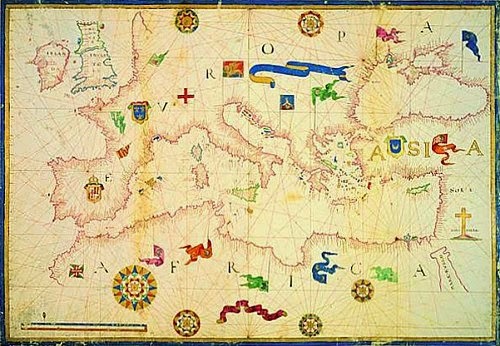 There is an understandable tendency to romanticize the Mediterranean meeting-places, and the darker reality of trans-Mediterranean contact in (say) the early modern period also needs to be born in mind: the ascendancy, between the fifteenth and the early nineteenth centuries, of the Barbary corsairs, and the close intersection between piracy and trade. Before the final suppression of the Barbary corsairs, the Mediterranean had only ever really been free of a serious threat from piracy under Roman imperial rule, as a result of Rome's political control of more or less all its shores and islands. But piracy reveals some of the most extraordinary cases of mixed identity: corsairs from as far away as Scotland and England who, outwardly at least, accepted Islam and preyed on the shipping of the nation from which they came. This darker side of Mediterranean history also encompasses the history of those already mentioned whom the pirates carried back and forth: male and female slaves and captives, though they too, like the historian Polybios, could play a notable role in cultural contact between the opposing shores of the Mediterranean. The unity of Mediterranean history thus lies, paradoxically, in its swirling changeability, in the diasporas of merchants and exiles, in the people hurrying to cross its surface as quickly as possible, not seeking to linger at sea, especially in winter, when travel became dangerous, like the long-suffering pilgrims ibn Jubayr and Felix Fabri. Its opposing shores are close enough to permit easy contact, but far enough apart to allow societies to develop distinctively under the influence of their hinterland as well as of one another. Those who cross its surface are often hardly typical of the societies from which they come. If they are not outsiders when they set out, they are likely to become so when they enter different societies across the water, whether as traders, slaves or pilgrims. But their presence can have a transforming effect on these different societies, introducing something of the culture of one continent into the outer edges, at least, of another. The Mediterranean thus became probably the most vigorous place of interaction between different societies on the face of this planet, and it has played a role in the history of human civilization that has far surpassed any other expanse of sea.